Fine print: Offer expires on 10/19/16 at 11:59 PM PT, or while supplies last. Every Bewitched Glow Mystery Box will include Xena (Boho Glam) and Johnny (Bombshell). Other products vary. Purchase of multiple Bewitched Glow Mystery Boxes will result in polish or product overlap. Offer may not be combined with any other promotional offer or discount (e.g Maven 20% discount). No exchanges or returns are possible on Mystery Box or individual items. Estimated full retail value is at least $100. Taxes vary by location. GOING FAST!!! New Julep subscribers can get their first box free when they sign up for a monthly Julep beauty subscription and take the quiz. This Halloween inspired 3-piece box is a great way to get started with Julep. ***Please note – you must be sure to let your readers know this is an offer for a monthly subscription service which has a recurring fee. A beauty HAUL-O-WEEN! The Treat: Your first beauty box is FREE (limited time only). 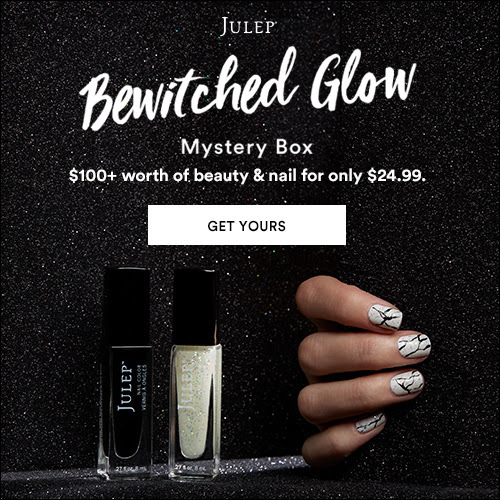 Julep is so excited to send you a shimmering fall polish, perfect for Halloween festivities and beyond in addition to two more beauty treats selected especially for you based on the answers you give when you take their beauty quiz. Join Maven now and this 3-piece Halloween welcome box is free! ($40+ value) with code TREAT. ← Loot Crate: Halo Icons Figure Reveal! !